The Rangers played an outstanding game in defeating the Oilers on Saturday, for their 6th straight win. The Oilers were predicted by many to be a Stanley Cup contender, and in large part that's because of the emergence of Connor McDavid as the (maybe) Best Player in the Game. The Oilers' Cup Parade (where fans will throw Bobby Nick's Burgers instead of confetti, and piss in public sinklets) may have to wait, though, as the Oilers, like the Rangers, have started the season poorly, at least when it comes to wins and points. On ice the Oilers play a high event game, as the indispensable Sean Tierney (@ChartingHockey) shows, but they just have under-performed their expected goal results. A big reason for that on-ice shooting dominance is McDavid and his line with Draisaitl/Maroon. As of this writing (11/13/17), McDavid is ranked 17th in the league for forwards in team on-ice CF% (over 100 5v5 minutes), with a 57.97 CF%. For reference, according to Corsica.hockey, in the entire BehindTheNet era (since 2007), only 18 forwards have finished a season with a CF% better than 57.97% over 1000 5v5 minutes. In other words, McDavid and his line are driving play this season, regardless of his team's position in the standings. McDavid is used to winning the shot battle on the ice. He's played 144 regular season games in his career, and he's finished with at least a 50% CF% (5v5 unadjusted) in 88 of them - 61%. So he's ended up with a CF% (5v5 unadjusted) less than 50% in only 56 games (for ease, I'll call these the "Sub50% Games"). The Rangers on Saturday held him to 47.22% CF% over 20:40 of 5v5 time - only the 6th time he's been under 50% CF% this season. [Interestingly, it was only the 44th "best" result of these Sub50% Games. The 43rd best? Last season's Oilers' visit to MSG, where the NYR held McDavid to a 46.67% CF% in about 15 5v5 minutes]. This was a team effort, for sure, but 5 Rangers were instrumental to keeping McDavid under control: the F line of Nash-Hayes-Zuccarello, and the D pair of McDonagh-Holden. How good was the five-man unit? As the next few pictures show - historically good. To explain: 165 skaters (F and D) played at least 7 5v5 minutes against McDavid in the 56 Sub50% Games. 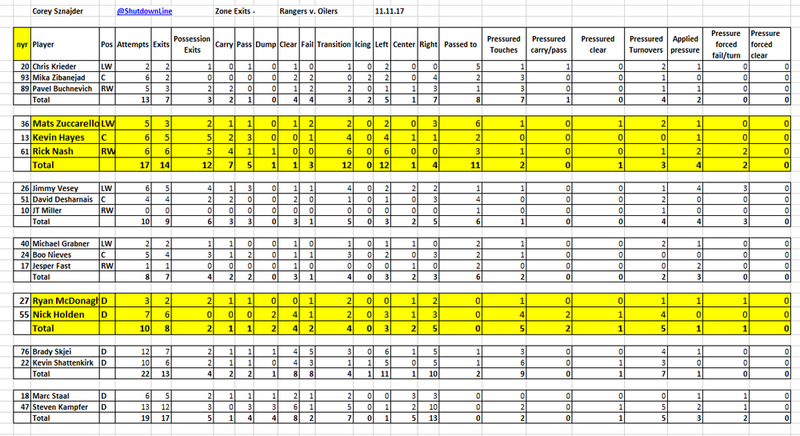 The 10 Rangers from Saturday's game (yellow), and last year's game (blue) are highlighted. 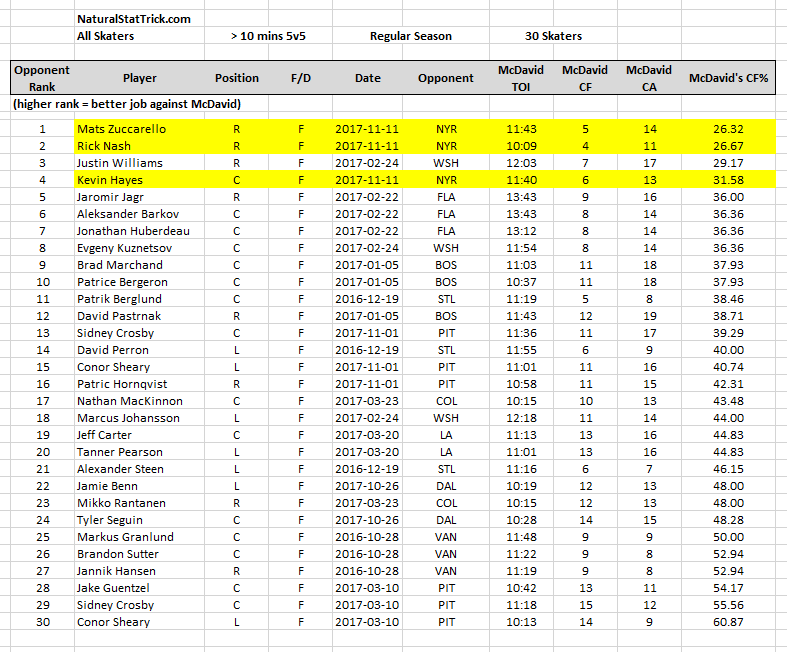 I've hidden some rows to make it easier to see - but this year's game was pretty darn good overall for that 5-man unit: Zucc (14th best), Nash (15th best), Hayes (26th best), Holden (45th best) and McDonagh (73rd best). When you filter further to all skaters who had at least 10 5v5 minutes against McDavid in the Sub50% Games, this 5-man unit looks even better. There are only 59 players who fit these parameters in McDavid's entire career, and the NYR forward line from Saturday has the 2nd, 3rd, and 5th best result against McDavid. Further refining it to just the 30 Forwards in the group, the NYR Forward line basically had the best game against McDavid in his NHL career - well of course Justin Williams manages to ruin the clean sweep. Finally, a little love and respect to Holden and McDonagh. 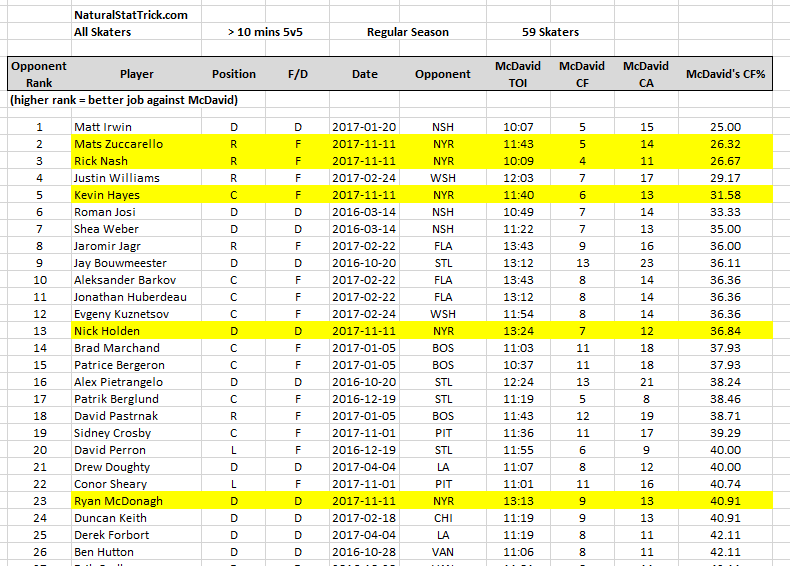 There have been only 29 Defensemen who've played over 10 5v5 minutes against McDavid in a Sub50% Game, and Holden and McDonagh have the 5th and 8th best result. Of course these parameters are randomly selected - there are likely games where McDavid ended up with a positive overall CF% even though he lost a battle against one F line or a set of D. But look at the TOIs for these 5 NYR guys from Saturday's game - there are only a few players in this entire group of NHLers who played more 5v5 minutes in a single "bad" McDavid game - and the NYR grouping, especially the F line, dominated him more than almost anyone. We can look to other data to see how that might have happened. You all know that Corey Sznajder (@ShutdownLine) never sleeps, and tracks a bunch of microstats like zone entries, exits, and passing combinations. It is invaluable work. Corey has been prioritizing a few teams so far this season, including the Rangers, so we have the microstats from Saturday's game. These results aren't McDavid specific - these are the entire 5v5 results. The above picture is team blue line defense - who was targeted by the Oilers on the rush. Holden and McDonagh allowed only 2 shots off the these 9 total entries (which is good, compared to the other NYR pairs for that game). Even if the McDonagh/Holden pairing didn't have many "break-ups" at the blue line, considering the high number of minutes McDonagh/Holden played against McDavid 5v5, these are good results overall in my opinion. The Oilers line entries show pretty much what I'd expect of any McDavid game- McDavid carries the puck in the zone a llllllooot, and is really successful at it. 11 shots off of 19 entries for that line. If this is McDavid having a *bad* game...ooof. Looking at the NYR Zone Exit data, there's a lot to play with here. Corey is a machine. I highlighted the NYR 5-man unit we're focusing on here - and they look decent. McDonagh/Holden didn't have a great ratio of exits with possession (just 2 of their overall 8 exits were with possession), and Holden seemed content to just "clear" the puck. But compare their failed exits (only 2) to the Skjei/Shattenkirk pairing's (8). Also note that the McDonagh/Holden pairing had 5 "Pressured Turnovers", the same as Staal/Kampfer, and better than Skjei/Shattenkirk. No icings for that McDonagh/Holden pairing either. Again, considering the "McDavid Competition Factor", this seems good enough. Let's pause a moment to check out that Kampfer stat line. 13 attempts, only 3 exits with possession. 2 pressured touches (meaning he's attempting to exit the puck under pressure), and 5 pressured turnovers. The Hayes line stands out too. 17 exit attempts, 12 with possession - far more than any other line - and only 3 fails. This suggests to me that they spent a fair amount of time in the defensive zone, but we're able to get it out relatively easily. They also had success in the offensive zone - the line had 4 "applied pressure" events, and caused 2 Oilers' exit fails/turnovers. The only other NYR player to have that success was Vesey, who was basically a one-man forechecking machine. Looking at the NYR zone entries, I only focused on the NYR forwards. The most significant data to me is the sheer volume that the Hayes line had. 24 entries and 17 shots off those entries. And they were successful regardless of very they carried the puck (11 shots on 13 carries) or dumped the puck (6 shots on 11 carries). This suggests to me that they played a strong transition game *and* a strong forechecking game. Nash and Zuccarello each had at least 9 entries - the same amount as the next best line had *combined*. Finally, looking at the McDavid's line zone exits, a few noteworthy things. McDavid has *zero* touches and exits*. Maybe the Oilers' system is to get the puck to McDavid in the NZ (12 "passed to" events), but it seems to me the less you give McDavid touches in any zone, the better. The NYR were particularly successful against Draisaitl - 7 touches, only 3 exits, and 5 pressured turnovers (the most of any F in the entire game). *You'll note, in the game tape below, that McDavid does touch the puck in the DZ at one point, but for whatever reason it is not counted in Corey's data. Admittedly, I am not an expert on Corey's methods and rules. Overall - I think Corey's data shows that the NYR 5-man unit was heavily involved in this game. the high number of events in both the OZ and DZ for both sides suggests it was a back and forth game when these players were on the ice. The McDonagh/Holden pairing was fine (at worst), and the forward line was especially involved, in all three zones, with positive overall results. When you combine these cumulative 5v5 microstats with the superb CF% results shown earlier, this 5-man unit had about as good a game against McDavid as you could ever hope for. Finally, if this wasn't long enough, I wanted to look at some specific examples of how well that unit played against the McDavid line with game video. This is a first for me, so I'm still working through the best capture and editing methods. All of these clips are from the first period minutes of the game. The quality at the beginning of this clip is farked, but notice where Hayes is as the Oilers begin a structured breakout - he *starts* at the blue line, with no forechecking pressure applied at all. Watching the game, it's clear this was the NYR gameplan against McDavid all night. Clog the NZ, and try to cause turnovers/minimize McDavid's ability to skate the puck. [Ok so this is probably every team's game plan]. Only when the Oilers' D gets to the red line do Hayes/Nash commit and pressure a dump in. Holden beats McDavid to the corner, and rings the puck back to the other side. Nash is all alone because the Oilers D has gone for a change, so he gets a free out to Zuccarello. Then Hayes *and Holden* drive the net for a chance, with Nash high in the slot for a rebound, and I've frozen the play there, as shown in the following picture. This is where it gets interesting to me. Holden has driven deep for a scoring chance, McDavid has come back deep to cover Hayes. Draisaitl has picked up the rebound, and turns the other way. 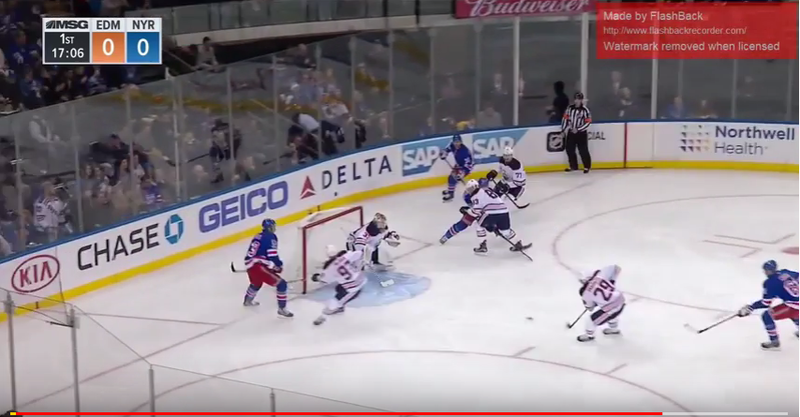 Look at how far in the corner Zuccarello is. Roll the tape. Draisaitl carries the puck to the corner, and leads McDavid as he turns up ice. Nash commits to putting some initial pressure on McDavid *before he can get the puck cleanly* which causes McDavid to dish it (amazingly well) to Draisaitl again. "Don't let McDavid carry the puck with speed through the NZ?" Check. Zuccarello keeps skating all the way around the net, catches up to Draisaitl at the blue line, and causes a turnover which Nash collects in the NZ. Nash then turns the puck right back up the ice, where Hayes is, who can dump it in to allow the team to regroup. Zuccarello gets in on the forecheck *before the Oilers can prepare a breakout*, which causes just enough mayhem to allow the rest of the NYR to change. Moving to the next clip. This play starts with an OZ faceoff. Hayes is tossed, and Zuccarello cleanly loses the draw to Draisaitl. Hayes immediately bolts to the far right post, anticipating the hard pass along the boards. Maroon flies the zone a little early, and the rim around isn't clean [heyooooo], so Hayes is able to almost intercept it. Now Maroon's is caught so he just swipes the puck out of the zone, giving Holden the chance to collect the puck, and turn it to McDonagh to move back up ice for a dump in. Again - the key - the Rangers have taken away the Oilers' ability to get McDavid the puck on a breakout. Roll the tape to continue the play. Again Zuccarello is first to the forecheck, causes a rushed play from the Oilers' D, and Nash is right behind him. There were two patterns for the NYR forwards against McDavid in this game - when the Oilers had time to set a breakout, the NYR fled the OZ, and clogged the NZ. But if the NYR had a chance to catch the Oilers' D on a dump in recovery or a turnover, they attacked deep. McDonagh pinches down on Draisaitl, and Zuccarello takes a chance putting himself between the puck in the corner and McDavid (who is near the point McDonagh vacated). Nash's pressure squirts [heeyyooooo] the puck free - right to where Zuccarello is waiting. He passes up a shot (for some reason) but the Rangers Fs continue quick skating to keep the pressure on the Oilers deep for a few more seconds, again allowing the change. Another successful shift against McDavid's line. He never touches the puck the entire shift, and it never leaves the Oilers' zone. Now we get to Nash's 1st period goal. This is a long clip, but it shows so much. The play starts with the Nieves-Grabner-Fast line taking a D zone faceoff with Skjei/Shattenkirk. The McDavid line is on for the OZ faceoff, and it squibbles to the corner. Shattenkirk gets position on Maroon, and sends a hard pass up the RW boards. Fast actually loses the battle to the Oilers' D who pushes the puck down deep again. Skjei and Nieves combine to get the puck flipped out high to the NZ and rush for a change. This could be danger time for the NYR. They are heading off the ice for a change (to get the NYR 5 man unit on), and McDavid is now turning at the center ice faceoff dot with a free pass available from the Oilers' D. Skjei gets stuck - but the other 4 NYR players manage to change. Skjei has to back in because McDavid is flying into the zone, and he has 2 other forwards to either side (giving him a lot of options to move the puck). McDavid skates to the boards, and then pulls up, which actually gives the NYR an extra breath to get to position. By now, Hayes has made it to the play, and McDonagh is in the slot to pick up Draisaitl. Seeing no option down low (maybe), McDavid elects to put the puck to the point, but Zuccarello is again in great position to challenge the D, and the puck gets dumped back behind the net. McDavid leaves the puck for Draisaitl, but McDonagh comes from behind and strips him of the puck. The NYR have all 5 guys within 15 feet of Hank. But McDonagh flubs the pass to Nash (or vice versa), and now the Rangers have to regroup. The Oilers' point shot goes wide, and Zuccarello, of course, is first to the puck. Its hard to see on the video because it happens so fast, but he looks over both shoulders to see how much time he has, and where his teammates are (its 0:30 on the clip). That let's him see Hayes and Nash bolting the zone, and gives him the chance to throw a tough-to-handle, soft line drive into the center ice area where Hayes is heading. The Oilers' D steps up to Hayes/catch the puck at center ice, the puck takes a good Rangers bounce to Nash, and all of a sudden the NYR have a 2-on-1. A few things I hope you take away from this video. First, the NYR seemed to have a game plan on how to handle McDavid's line, starting at the Oilers' goal line. Second, the Hayes line skated super well - just quick reactions and skating to the puck all over the place. Third, even with that, they needed some good fortune to have pucks come to the right place for this all to work out. Looking at the overall results, the microstats, and some game video, we see just how solid a game the Hayes-Nash-Zuccarello-McDonagh-Holden unit had against McDavid. McDavid had an off-night, one of the worst of his career, and it was largely due to the smart thinking, quick skating, and overall play of these 5 guys. PS: Donate to @ShutdownLine here. Donate to @NaturalStatTrick here. Donate to @Corsica here.